Comments: ***Many answer fields are already completed - reading copy*** Has some crinkling. Acceptable Condition. Five star seller - Buy with confidence! Alice A. Arana is an instructor in Spanish at Fullerton College. She received her M.A.T. from Yale University and her Certificate of Spanish Studies from the University of Madrid. Professor Arana taught Spanish at the elementary an high school levels, and has taught methodology at several NDEA summer institutes. She is coauthor of the first edition of A-LM Spanish, of Reading for Meaning-Spanish, and of several elementary school guides for the teaching of Spanish. In 1992, Professor Arana was named Staff Member of Distinction of Fullerton College, and was subsequently chosen as the 1993 nominee from Fullerton College for Teacher of the Year. 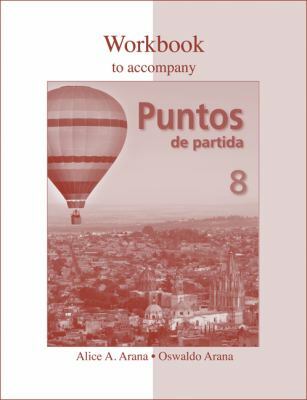 She is currently serving as Academic Senate President.Arana, Alice A. is the author of 'Workbook to accompany Puntos de Partida', published 2008 under ISBN 9780073325583 and ISBN 0073325589. Loading marketplace prices 14 copies from $1.49 How does the rental process work?